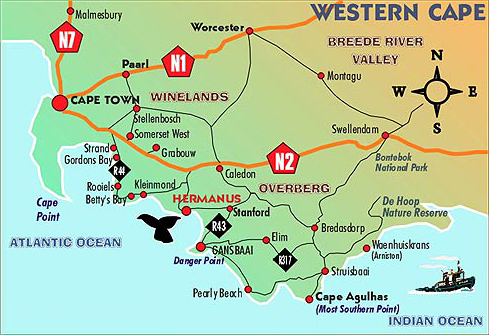 From Cape Town, take the N2 past Somerset West and Grabouw, turning-off onto the R43 for Hermanus/Kleinmond. Past the villages of Fisherhaven and Hawston, take the right hand turn off at the Vermont-Lynx Ave sign. There is also a brown whale and B&B sign. At the end of Lynx Ave, turn right into Siffie. At the stop sign, turn right into Ghwarrieng and again right into Kandelaar. Follow Kandelaar onto a slight hill and turn right at the first opportunity. This is Tiptol Crescent. Turn right again and On the Vermont Guest House is the pink villa at number 24 on your left.